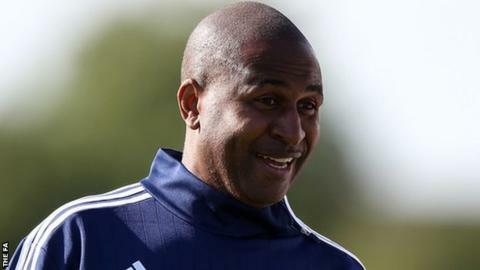 Carlton Fairweather: Sunderland Ladies have "nothing to lose"
Sunderland Ladies manager Carlton Fairweather says his side have "nothing to lose" as they attempt to win the Women's Super League One title at the first attempt. The Lady Blackcats, who were promoted from WSL2 last season, go into their final three games of the season three points behind leaders Chelsea. "For us, we have three major cup finals basically," Fairweather told BBC Sport. Sunderland have the toughest run-in all of all the sides looking to lift the trophy as they face the other three title contenders in their last three matches. After travelling to Manchester City on Sunday, they host Arsenal on 26 September before finishing their campaign at Chelsea on the final day of the season. Fairweather admitted the odds are against his team as they face such a daunting string of games and their recent form has been poor. "You have to be realistic in your approach and the fact that we're playing the best sides in the league is a mammoth task," he said. "It's not an impossible task, but obviously things are against us in respect to the sides that we're playing against." Winning the WSL1 title is a "mammoth task" for Sunderland Ladies says boss Carlton Fairweather. Sunderland head into Sunday's game after failing to win any of their five matches during August and having been knocked out of the Continental Cup. Fairweather has partly blamed recent results on complacency within the squad, but he insisted there will be no sign of that against Manchester City. "We've sat down and had chats with the players individually and collectively," he added. "With the cup games now out of the way, it gives us time to regroup and focus on the last three games and making sure we can do as well as we possible can do."